Have you ever wondered how to make lemonade? It seems like such a simple thing. Until you actually try to do it. Making lemonade from scratch is fantastic for a bunch of reasons. First, it tastes incredible. There’s nothing like freshly squeezed juice from real lemons. Making your own also allows you to avoid the nasty chemicals and preservatives in store bought lemonade. However, the biggest reason I like to make homemade lemonade is to avoid the sugar in the store bought stuff. Since the boys were little I’ve been making this homemade lemonade recipe with a mere three ingredients –lemons, stevia, and water. Recently, I’ve cut back on my intake of sweets. With summer heating up I’ve been making several pitchers of this sugar-free lemonade for myself and the boys each week. As a parent of teenagers who are increasingly on their own and free to make independent food choices I enjoy getting something healthy into them as often as possible! Lemons are incredibly healthy and full of amazing phyto-nutrients. They are also a great source of Vitamin C, one of the most important antioxidants around. Further, lemon juice is very alkaline, balancing the pH of the body, and it is also incredibly helpful to the immune system. For the best flavor result in this lemonade recipe be sure to use a brand of stevia that is of excellent quality. My preference is for the product linked in the recipe above. I cannot consistently find it at the grocery stores in my area, so I purchase it online. We like our lemonade pretty tart, so if this lemonade recipe is not sweet enough for you, feel free to add as much stevia as your heart desires! 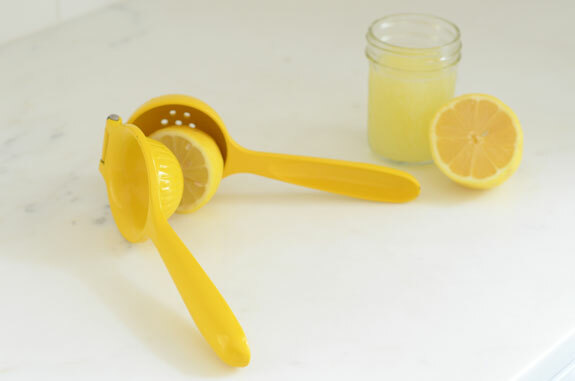 If you really want to know how to make lemonade like a pro, you’ll need the handy dandy lemon juicer in the photo below. It’s fantastic for juicing lemons easily. To maximize juice output from the lemons I not only cut them in half, but cut the tip off of each end of the lemon so that there are more areas for the juice to exit when I squeeze them. How many lemon approx make 1 cup juice? On average it takes about 6 standard size lemons! So simole and SOOO easy. Lol I was able to find 100% pure Stevia powder. It is SUPER strong stuff. I finally broke down and bought an electric lemon squeezer on Amazon. Since my hands get sore from juicing lemons so often, this makes it much easier. And I can get ALL the juice out of each lemon, lime or orange. This recipe looks YUMMY! I just bought some fresh peaches from the orchard here in Texas and can”t wait to make a pan of peach cobbler. And I’m real fond of apple cobbler too. Thanks so much for posting the recipe. Any suggestions for a natural sweetener such as raw honey. I don’t use artificial sweetener or stevia. 3 pears to 5 lemons more or less to taste. Although some people are allergic to pears, it is one of the least allergic foods. Elana, thanks for the tip about cutting off the ends of the lemons. Thank you so much for this recipe! I was looking a simple and healthy recipe for lemonade and I found your page. You made my day. Using a soda stream or old-school soda fountain would make a delicious fizzy version of this! Anyone concerned that this tool is made from aluminum? Stevia is illegal to use in Canada. Not approved by environment canada for import. Environment Canada is the national weather agency so I’m not sure where you’re getting your info from. Stevia can be purchasd in Canada.